Get a First Look at the AX 2019 Program Guide Art by Zelda C. Wang (ZeldaCW)! At Anime Expo, we are committed to supporting the community, and the artist community is no exception. 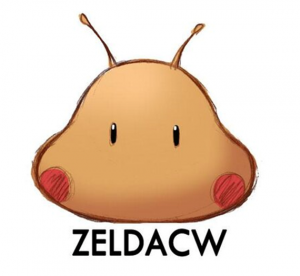 This year, we are excited to collaborate with a familiar name for the AX 2019 program guide cover, which features art from Zelda C. Wang (ZeldaCW)! After bringing back our four mascots – Ai, Xeno, Kisegi, and Mahoko – in the 2018 artwork, we again decided to make them the main focus for this year. Since Zelda is the original creator of Ai, Xeno, Kisegi, and Mahoko, originally designed for our 15th anniversary, she was the obvious choice to create this year’s cover art. Additionally, veteran attendees may recognize her program cover art from 2006, 2007, and 2008. Building on that sense of nostalgia, we decided to throw it back and pay tribute to the last twenty-eight summers of Anime Expo. Zelda’s dreamy, sentimental cover art is filled with references to past years, including old artwork, snacks, and more! How many do you remember? The AX 2019 program guide cover art will be available as AX official merchandise throughout the show. AX Merch Stores are located in the South Hall and West Hall Lobbies. Come get your merchandise early during Pre-Show Night on July 3! Additionally, the in-progress pieces for the cover art will be on display in the Art Show. Stop by and check them out! I grew up in Taiwan, and during the afternoons, the “cartoon hour” TV shows were all anime. I remember fighting for control of the remote because different channel would show different programs at the same time. When did you first attend Anime Expo? Probably around 2002-2003…I can’t remember exactly when because my brother surprised me with the trip. He only got us the Exhibit Hall Passes (which were discontinued in 2014) and we only stayed for a few hours. Can you please share a little bit about your process of creating the mascot characters? It was around 2005-2006. I was volunteering in the Graphics department for SPJA and I wanted to create a character with a cheerful, energetic personality to represent Anime Expo on promotional materials. So I made Ai, the girl with the pink twin-tails and the cute AX cube hair accessories. Xeno came naturally since I needed someone calm and poised to be Ai’s tsukkomi – I mean partner. 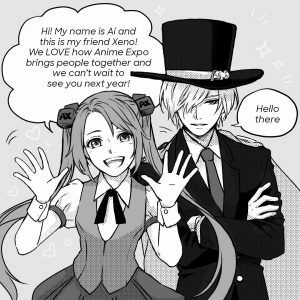 Their names Ai and Xeno stand for “love for foreign culture/things/people” and make up the initials for AX. 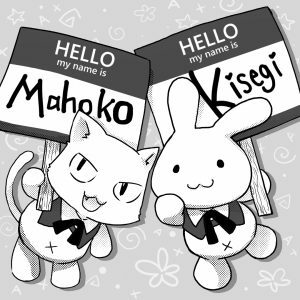 The bunny, Kisegi, and the cat, Mahoko, were created to be Ai’s stuffed animals because a cute girl needs her cute companions. At the time I didn’t realize they would become AX mascots; I simply created them out of my own interest and passion. What do you love about Anime Expo? It’s close to where I live. Ahem…I mean…I’d never attended anything like AX before, so naturally, it had a special place in my heart. It’s amazing that a group of people with the same interest spent so much energy and effort to organize an event like this to bring even more people together to enjoy anime. The last cover art I made for AX was in 2008, but I continued attending Artist Alley every year since 2009, and over the last decade I can see how much AX has grown. 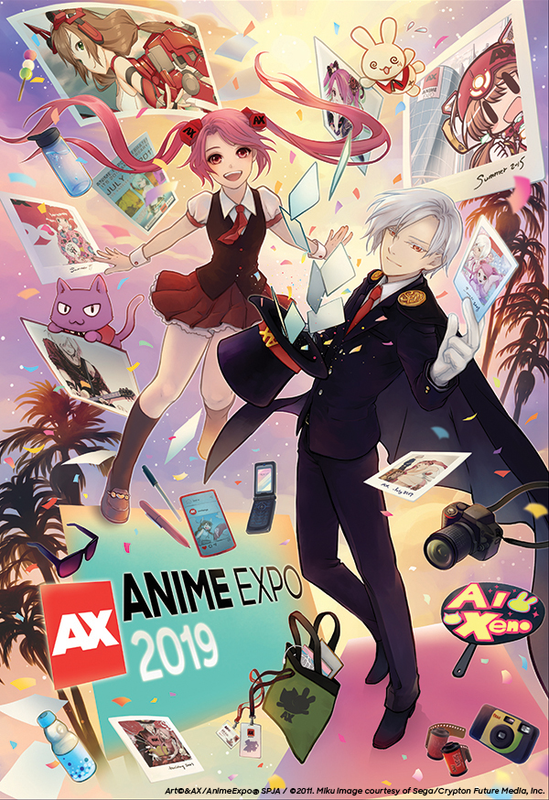 I’m glad that its core values never changed, and I’m very happy to have this opportunity to work with AX again to create this year’s program guide cover art. Find Zelda in Artist Alley!